Homepage. This page: A rare magazine from the 1950s which focused on road safety issues. A copy of The Safe Driver from 1958. Whereas magazines such as Car Mechanics and The Autocar were freely available in newsagents up and down the land, this magazine, titled 'The Safe Driver' was, we're told, 'for private circulation only', available as it was to members of the Order Of The Road only. 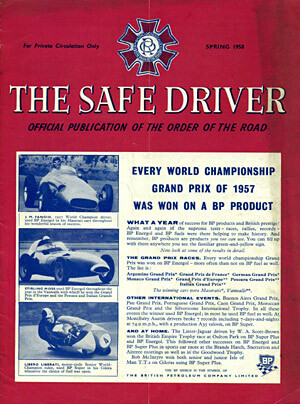 Motor racing drivers were obviously thought of as good safe drivers by the editor of The Safe Driver, as the full size advertisement on the front cover demonstrates. BP, or the British Petroleum Company to give it its full title, was justifiably proud of its involvement with motor racing in 1957. The advert shows Juan Fangio in his 250F Maserati heading towards his World Championship crown, his car running on BP Energol (not Castrol R?) throughout the season. Below the Maserati is a picture of S. Moss piloting the British Vanwall that he raced in 1957, and below that a photo of Libero Liberati, a 'Senior World Champion' rider hanging on to his Gilera while cornering at speed. Mentions within the text of the advertisement also recognise a record breaking drive undertaken in an Austin A35 at the Montlhery racing circuit, and Archie Scott-Brown winning the British Empire Trophy at Oulton Park in his Lister-Jaguar. This magazine is much smaller and slimmer than the commercial titles available in the late 1950s, as you'd expect for a limited run club magazine. The emphasis of the adverts and articles within is very much on road safety, and issues surrounding the subject. The inside front cover shows an advert for Delaney Gallay Ltd safety belts, claiming that 70% of all injuries in car accidents happen to the front seat passengers (no airbags in those days). Most cars in those days were not fitted with any form of occupant restraint. Other companies, such as Britax, also offered after-market seatbelts, although they were usually of the lap-belt arrangement only, with just one strap passing over the outer shoulder. 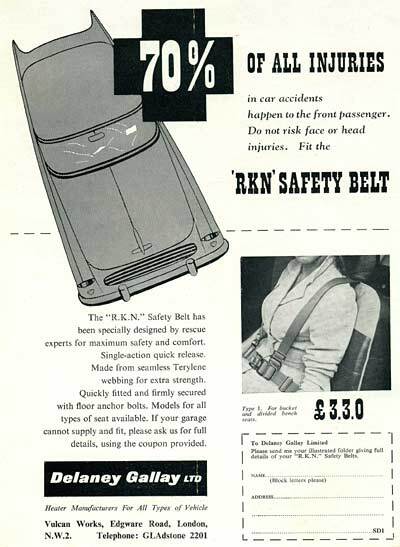 The 'RKN' Safety Belt shown in this advert is interesting as it looks to be based on competition car principles, with twin shoulder straps, passing over either shoulder, similar to the four point harnesses that are usually fitted to rally cars. The only thing missing is suitable support for the neck in the event of a shunt - a lack of head restraint on car seats of this era is a significant problem, so you'd probably still suffer nasty whiplash at the very least, but hopefully you'd avoid making a date with the car's windscreen. Delaney Gallay are perhaps best remembered for their range of aftermarket car heaters. 1. To give first consideration to all drivers, cyclists, pedestrians and other road users when driving on any public highway. 2. To give clear signals, in the manner approved by the police authorities, to other traffic concerned when it is desired to alter direction on the road or when about to slow down or stop; realizing the responsibility neither to give such signals nor to deviate from your course unless there is ample time for other road users to observe and act upon these signals. 3. Never to overtake another vehicle unless this can be done without inconveniencing any other road user. 4. Never willingly to stop a vehicle in any position on a public highway where its presence would constitute a danger to other traffic. 5. To give ample space for other traffic to pass, and to keep as near as is safely possible to the left-hand side of the road under all conditions. 6. To drive with caution at all road crossings and junctions. 7. To realize that by using effective anti-dazzle devices approaching vehicles are helped on their way. (This courtesy is not advisable unless the road immediately in front is known to be clear, "blacking out" being a fruitful source of accidents). 8. The inform the order AT ONCE of participation in any accident during any year of membership, and when a conviction for any road offence is suffered. 9. To make certain, so far as is possible, that the badge will not be used by any unauthorized person. 10. To return the badge immediately membership of the Order terminates, and to abide by the decision of the Executive Committee regarding application for and continuity of membership of the Order. Convert the railways into roads! "... quite apart from the problem of the tunnels which, by reason of their height and width present a terrific problem you are faced with the problem of all the little bridges which, in the case of the main roads, would have to be rebuilt. There would still be left the accursed level crossings, all of which would have to be bridged if the speeds mentioned are to be maintained ... "
Curiously most of the correspondants seem to be ex-military or in some way titled - in addition to Lord Sandhurst, comments also came in from Brigadier Anderson, Wing Commander Bethell, Captain Munk and Brigadier Lloyd, who came up with the original idea. "Sir, I have now completed my car driving without a knock of any kind and with seventeen different types of car, for a period of 55 years. I have now sold my car and may not continue motoring. I consider that all persons over 75 years of age should be refused a driving licence. I think my accident-free driving period must be a near record among your members. I should like to retain the badge with the 55-year driver plate on it as I wish to frame it with my A.A. badge." "Sir, I see that in London you now have the Radar Speed Trap, but with a difference in that the Metropolitan Police are operating it on a table on the pavement in full view of the public. Did you read Basil Cardew's article on this in the Daily Express, Friday January 17th? I thought it was very good indeed and very sensible, and he expressed the opinion that motorists would react as they do to all fair play, and they do not react to methods that reek of the Gestapo. Up here in Lancashire we have, of course, the Radar Speed Trap, but the deceitful manner in which it is operated is causing a great amount of animosity between the average law abiding motorist and the Lancashire Constabulary. They put this radar equipment in the boot of a gaily coloured car which they stop outside a house, the bootlid being raised and a few cartons camouflaging the equipment. The idea is, of course, that the motorist will think it is merely another motorist taking goods into his house. They alternate this system by using a plain delivery van and a plain estate brake. These, of course, have the rear doors open and one is again apt to think that it is a merchant delivering goods to a house. This is not a case of "sour grapes" because they have not caught me - as yet! Now our Chief Constable is busy trying to tell us what a huge reduction in the accident rate the inauguration of this system has caused, but we are requesting figures of proof, so the results should be somewhat illuminating." Some things never change eh! 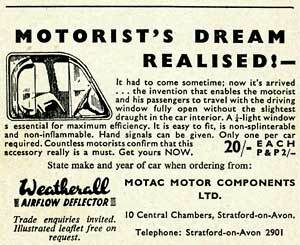 The remainder of the magazine is given over to a handful of articles, including one on motor-car lighting by a Dr. J.H. Nelson, the Chief Lighting Engineer for Joseph Lucas Ltd, a debate over road signalling, some motor car accessories, and a list of recently joined members to the Order. Hidden near the back of this issue of The Safe Driver are some interesting facts that the Annual Census of Motor Vehicles for 1957 has brought to light - there were 7,427,101 motor vehicles used on Britain's roads, excluding Government-owned vehicles.